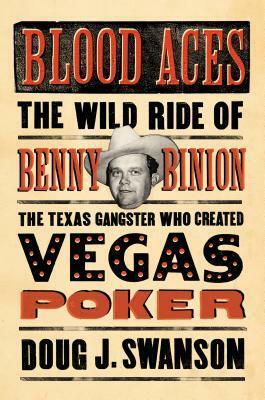 Blood Aces, is the story of Benny Binion and his life from Texas to Las Vegas. Most of the book is about him growing up in Texas and how he did not go to school he would go around with his father and do deals shady ones on selling horses and other cons, as he got older he started working for men how ran gambling houses and running other illegal items. He also ran liquor across the border during the depression and after a while started running his own numbers racket. By 1932 he was into everything in Dallas and even had someone on the Sheriffs’ dept. who would call him and tell him when a raid or an arrest were about to happen. By 1936 it was worse he and one of his men killed a man in broad daylight in the street of Dallas and months later the D.A. said the case was dismissed for lack of evidence. By 1946 he had to leave Dallas for his people were being voted out of office and a feud started with a Herbert Noble, who would survive 11 attempts on his life. In 51 his wife though would be killed in one of those attempts. By 47 once in Vegas Binion was trying any way to get in and own an hotel he would be co-owner to a couple, but he finally took over the Apache Hotel where the Horse shoe is now. He remodel the hotel putting carpet everywhere and adding more tables and slot machines. This is where he thrived, his years running and being around under world gaming establishments in Texas he brought to Vegas. Meals at a lower price but at a better quality than any other hotel in town, there was no limit on the size of a bet. He started the World Series of Poker with only a few tables, then it became a whole room now it is multiple days. This book ends with his death and that of his son, Teddy, but really it is so much more. The names of people are some we have heard of before and still to this day Steve Wynn, talks highly of him. Yes you see a side of him that at least I did not know about but it made sense to run a casino back then and make a ton of money. Overall a good book with a lot of facts from records from courts and other legal offices. I got this book from net galley. I give this 4 stars.